Red Cherry Eyelashes ~ Gold Precision Long, light, feathery black lashes sparkle under the moonlight. The gold tinsel towards the inside of your eye, responsible for the effect. He remarks at how beautiful you look tonight, and you smile back knowing you made the right decision when choosing to wear your Red Cherry eyelashes. After all, these lashes were handmade from the finest synthetic fibers they could find. The quality always exceeding price. 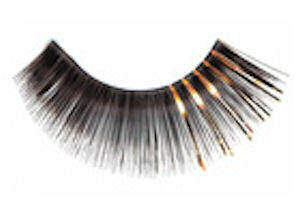 After tonight, you’ll be sure to wear these lashes again. A stark contrast to the cheaply made, throw away lashes, you mistakenly bought before. Applying your lashes had been simple. Using the lash adhesive you bought below, a simple dab along the edge was all it took to properly mold to your eye. Somehow these lashes seemed to fit the contour of your eye perfectly. Like they were made specially for you, and that this night was destined to happen. Looking and feeling this special is common among women who wear Red Cherry lashes. Don’t miss out on your own special occasion sure to happen when you purchase a pair of these lashes today.